A reader asks: I was wondering about the sizes of the cubs. Any estimates on where they are in their growth cycle and how big they will eventually become? I am also trying to grasp that they have a different coat color than black bears. Any particular reasons that you are aware of for the off-white color in the photos ? Or is this the end of the winter coat / youth ? CHARLIE: After a clear day and night it is foggy this morning and it didn't start burning off until 11AM. Last evening at 10PM, with the sun setting, I went flying as I love the still air in these conditions with out a ripple. The volcano, Alade, looks crisp and very close. It forms one of northern Kuril islands and is a 7000 foot cone with it's steep slopes going right into the sea of Okhotsk 40 miles SW of our cabin. I spot the cubs on the big alluvial fan at the east end of Kambalnoe lake. Because I have not seen them all day, I land on a strip of snow and walk over to say hello. The sun is setting and their fur is back-lit, so they have golden halos. It is interesting to see the new things they have found to eat now that spring finally seems to have arrived. Maureen and I have just finished a wonderful supper ourselves of wild garlic and fresh salmon as the first silvery sockeye are showing up in the river, so we too are able to live off the land a bit. The cubs follow me back to the plane, but get nervous when I start up but only run off about 50 yards and watch me take off. I fly along the mountains that form the spine of this peninsula looking for snow sheep (a wild big horn sheep) but have no luck and so head back to land in the red glow reflection of the mirrored lake; a colorful sunset caused by someone else's forest fires in another part of the world. 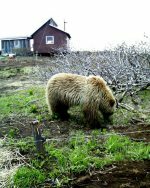 I want to discuss how we discourage the bears and foxes from touching things they should not touch such as my plane and the outhouse. We use a simple high voltage Ghallager stock fencer for the plane powered by 6 "C" batteries . It has a spike that is shoved into the ground; acting as a grounding rod and another hot wire attached to the metal frame of the plane. This puts out 2,000 volts and pulses once a second. 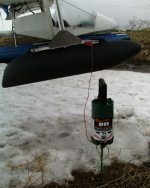 The plane is insulated from shorting out by its float which is an inflatable one of rubber and plastic. I carry this tool in the plane at all times because I can hook it up and then leave the plane without worrying. In a few days when the snow finally melts at my parking spot by the lake I will make a permanent satellite fence around the plane and power it by our cabin fencer. The outhouse toilet is protected by a low wire and we are experimenting with how high it needs to be off the ground. This one is 6" off the ground . 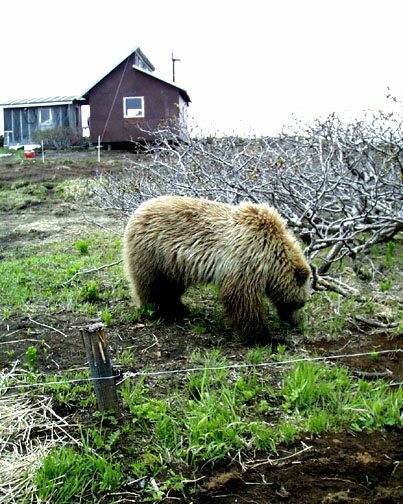 We have discovered that bears rarely step over an electric wire once they have been educated to it's shock ability. We have noticed if anything, they will try to crawl under. 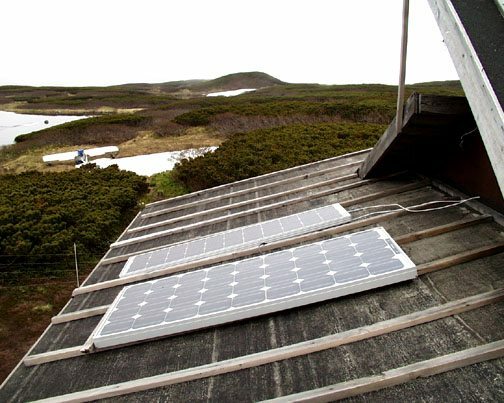 Our whole electrical system is powered by two solar panels which charge two 70 lb Gel Cell batteries. These panels work well even in the fog. The batteries give power to the electric fence, 3 lights and a small inverter which gives us 250 watts of 110 Volts AC power . This also operates the computer, satellite phone, dark room enlarger and small tools. Probably the most important item is the controller which is a small computer that protects the batteries from over charging and gives constant read-out on power available in the batteries.